Origin: Originated in Pakistan and India. Leopard geckos are increasing in popularity and are probably the most widely kept reptile pet next to the green iguana. Serious breeders have developed striped, high-yellow, "jungle," "ghost" and "leucistic" forms (to name a few) from the original wild-caught imports, which originated in Pakistan and India. Leopard geckos are easily kept in glass or plastic cages that offer 10 inches by 10 inches of floor space and at least 12 inches of height for each gecko housed. Paper towel, orchid bark or newspaper work well as substrate materials. Water should be provided in a shallow lid or bowl. Leopard geckos will also benefit from a hide box. 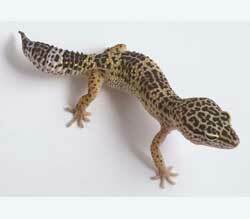 Captive leopard geckos are best fed mealworms or crickets. It is important to "power feed" such food items for a day or two to make sure that the gecko gets a nutritious, balanced diet. The cage should be kept off the floor at a temperature between 82 and 88 degrees Fahrenheit during the day, nighttime temperatures can drop as low as 64 degrees with no ill effects. Heat can be provided by heat tapes, hot rocks or a 40-watt light bulb placed on top of the cage's screen top.